Last installment, we discussed the importance of redefining metrics of success for social media. We concluded that “fans” and “followers” are not strong metrics to evaluate the impact of social media marketing. In this installment we ask, how do we measure social media success and marketing impact? To answer this question, we first need to fundamentally change the approach and thinking to social media’s position in the marketing mix. The creation and execution of social media marketing initiatives leaves much to be desired in its current state. Marketers have to ask, where does social media fit into the marketing portfolio? Little thought goes into the upfront design and structuring of these initiatives. In practice, some companies’ and agencies’ approaches to social media treat it as a replacement for several marketing tactics. Other companies and marketing agencies that service social media initiatives continue to emphasize tactics and focus on one-off initiatives. The result is that these methods do little to improve the bottom line or build brand loyalty, nor can prove any measurable results or value. Social media is, in fact, less about tactics and more about an overall holistic approach. Social media is not a replacement marketing tactic but rather an enhancement. It is entirely possible to reach goals, even “lofty” goals, set for social media or for general marketing objectives. To do so, however, requires less about the tactics employed and more about the overall approach to managing the complexities of social media and the modern consumer. Social media is digital, thus all aspects of digital, in particular search, needs to be incorporated during planning. Companies of all sizes now operate in a multi-market, multi-lingual and frequently multi-brand world. This world is filled with commercial and cultural nuances as well as an exponentially increasing amount of information and choices. As digital marketers are discovering, unlocking the value of the social ecosystem and building real brand loyalty with customers is a daunting task. It requires finding new ways to address the problems stated here while and thinking outside of current models. 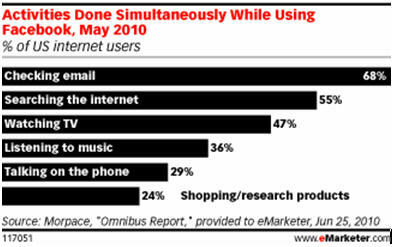 eMarketer reported on a study that found social media users multitask while using Facebook. They use the Internet while watching TV while checking email while searching online. The multitasking of the user and her use of media should compel marketers to treat social media as part of the marketing portfolio. As the graph above shows, the multitasking social media user also searches online. If the social media user is engaged, she’s essentially having a conversation. When engaged in a conversation, she wants to learn more. How does she learn more? She searches for information. Thus, social media must be viewed as a catalyst for search marketing. Search marketing, after all, is gaining visibility for user queries. Gaining insight into searcher intent (what are they really looking for?) is what the search marketer uses to select strategic points for search query visibility. Social media gives the search marketer insight into user query intent because of the context surrounding the social media conversation. The search marketer gains an additional layer of information to filter through all the “search noise” that is out there. Ultimately, the search marketer is able to make better strategic decisions for search query visibility. In our next installment, we’ll discuss connecting the dots and making social media work in tandem with search marketing to achieve specific goals.